Pride is the seventh deadly sin. In the Divine Comedy Dante describes how sinners carried giant stones on their backs on the First Terrace of Purgatory to learn that pride is a heavy burden upon the soul. 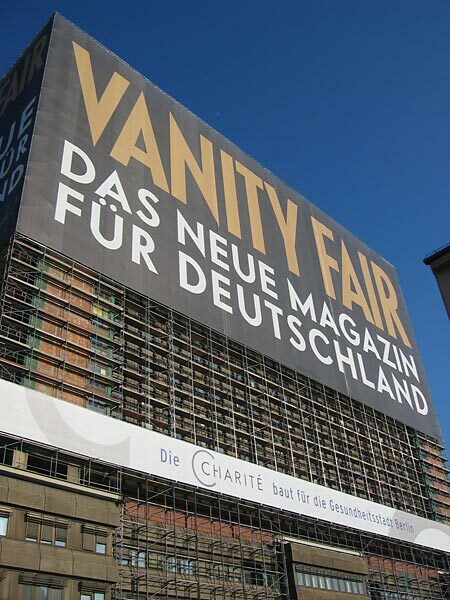 Now let’s replace pride with its close neighbour Vanity, and since this is an architectural journal let’s replace the Dante’s giant stones with huge slabs and you almost have this situation here: a fifteen-story high Vanity Fair ad covering most of Berlin’s monolithic Charité hospital. Advertecture is boombing in cash-strapped Berlin where whole buildings are habitually engulfed by an acreage of cleavage, running shoe or sports car, and emerge with a taught face-lift after extensive renovation. One can only assume that the tombstone-like Charité is currently undergoing its own plastic surgery. Hopefully its inner organs will be thoroughly diagnosed too: last June a wheelchair-bound patient spent three days in a defunct lift until someone realised he was missing.